The urgency that the F-Gas Regulation quota restrictions created from mid 2017 to mid 2018 may have subsided, but we are only one step on the way to much wider use of lower GWP Refrigerants. The market panic that created rapidly rising prices and availability issues on some refrigerants does not have to repeat itself, but action is needed to keep moving to lower GWP refrigerants. The quota restrictions are still in place and a further quota reduction of 30% on current levels will occur in 2021. The move away from high GWP refrigerants such as R-404A may have taken time to get started in 2016 and 2017 but in 2018 the switch occurred quickly and relatively easily with replacements such as R-448A and R-449A, both with a GWP below 1400 and suitable for new equipment and retrofit. The next step to go to lower GWP is more challenging as it is at the new equipment level that these changes need to be made. The A2L low GWP refrigerants such R-454A, R-454C and R-455A are able to bring GWPs down much further and with compressors approved for their use by the likes of Emerson and Bitzer they will start to find use in small condensing units very quickly. On new small air conditioning equipment we have seen R-32 quickly take over from R-410A as the refrigerant of choice. With this move led by the equipment manufacturers who are gradually introducing units with a larger charge size with R-32. For new equipment there may not always be a choice of refrigerant on offer as it will depend on compressors and equipment approvals. Where there are options in deciding whose equipment to use it is important to consider the life time required for the system and that further phase down steps every 3 years to 2030 will place greater pressure on systems with higher GWP refrigerants. There are still some easy moves to lower GWP that can be made for both new and existing equipment where R-134a may have previously been used. R-513A is a non-flammable azeotropic blend with a GWP of 631, less than half that of R-134a and can provide equivalent performance for chillers and medium temperature applications. For service requirements on all refrigerants the incentive to reduce and minimise leaks has never been greater. Reducing leaks not only saves money on refrigerant but also reduces demand on quota. Recovering and reclaiming for reuse is also very beneficial to quota as these products are quota free. Many leaks, if found early, can significantly reduce the amount of refrigerant lost. With quota likely to be tight again the emphasis of all contractors should be to upsell their services for better leak management and prevention. 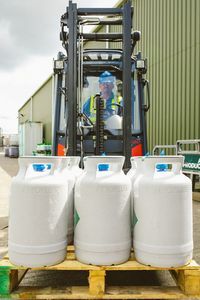 With lower GWP choices needing to be made for new equipment the low GWP A2L refrigerants, along with Ammonia, Carbon dioxide and hydrocarbons will provide the way forward as the market learns to use these products in increasing quantities in equipment designed for them. The best way to keep the lid on refrigerant prices is to reduce demand for higher GWP refrigerants and stay below the quota cap. R-454A, R-454C and R-455A are competing to be used in refrigeration applications where R-404A was used in the past, whilst R-1234yf, R-1234ze, R-513A and R-450A are R-134a alternatives. Meanwhile R-32, R-452B and R-454B are similar to R-410A. All the above have a GWP below 750. Use of low GWP mildly flammable A2L refrigerants needs to follow EN378 charge criteria for different location and access categories. With additional measures such as ventilation, leak detection and access restrictions, the charge size can be increased but needs to be coupled with a risk assessment. Those sectors that can use CO2 and Ammonia in new equipment can also help reduce the pressure on quota. At the end of this year refrigerants with a GWP > 2500 will be banned from new stationary equipment, but this should not present a problem as lower GWP solutions are available. The servicing of such equipment with refrigerant with a GWP over 2500 from the end of this will also be restricted to using reclaimed or recycled product where the charge is over 40 Tonnes CO2 equivalent. Don’t wait for 2021 to start moving to lower GWP refrigerants just because the pressure may feel as if it off, start the move today by talking to your equipment and compressor manufacturers to ensure they quickly bring to market equipment to support the very low GWP A2L refrigerants.